Why the focus on “Down-Under”? No thoughtful person would expect TeaPartyItis to be limited to the USA. That it appears elsewhere only gives it “Legs”. Winston Churchill was never in combat (although he did, as under secretary of the Navy, fight many battles). I guess the British population (which created the “Down-Under” as a penal colony, meaning most of the current population are descendants of criminals) made a big mistake putting him in effective charge of Britain’s war effort. silly brits! Henry, I’m not sure I understand what you were getting at in that post but let’s clear up a few things. Yes some parts of Australia were founded as a penal colony but not all. Most of the “crimes” were so petty as to be irrelevant in todays world. (stealing a loaf of bread as an example) If you study our history you will find we were and are, a peaceful, successful, multicultural society with great respect for the rule of law, and more than half of our 23,000,000 inhabitants are of cultures other than English. Perversely of course 🙂 there is now great pride in being a descendent of a convict. As for Churchill??? As the son of English parents, I heard many war stories and Churchill certainlay had his faults, but in my mind and of many others, he was without doubt, “The man for the times”.It seems to me you lack some perspective and need to do a bit more reading! I would like to add that the convicts only came to Australia when America was no longer available to them. America had convicts from 1600-1780, 150 years, Australia only had them 60 years, 1788 -1840, before they said enough is enough. Australia is a modern society with a high standard of living, not religiously influenced, laid back and democratic. It was not the British population but the small ruling class of merchant elites (bankers and corporations like the Crown) who ruled in a fascistic brutal manner, stealing land, homes and other assets from people across the British isles, who set up several distinct colonies on the Australian continent. They sent those whom they had oppressed, stolen from, framed and kidnapped to be their slave labor in (Crown) business ventures. Just like they had done for centuries prior in the Americas. Google “the forgotten white slaves” – hundreds of thousands of people kidnapped (most particularly from Eire) and sent all over the world, mostly to the Americas, prior to Australia’s discovery. Regards today’s population in Australia around 1 in 4 are born overseas and 1 in 2 have parent’s born overseas. Not that many here go back several generations as Australians. In any case, we are generally proud of our heritage and history of progressing to become a beacon of relative peace, prosperity and diversity in a largely hostile world. Smart people, those Americans. From he outside they can see how dangerous Abbott is. We need to follow suit. Higher-level frames, deeper in the system, have a disproportionate effect. In politics, the high-level frames are the moral systems that define what is “right” for a conservative or progressive. They (the conservatives) are adept at the framing, it has entrenched itself here, running it’s course, akin to a form of propaganda, even subtle brain washing. But it works. Progressive, visionary, labor politics do not adopt this skill to full advantage, use. You need not compromise political values, just learn to speak the universal language of how to frame it. See more of George Lakoff’s talks to have it explained better. It isn’t even that Aussies even really ‘like’ Tony Abbott, it is that the framing, the shaping has been repetitive and reinforced, it’s working, especially on those that may not have critical thinking skill developed like some of us have and do. While Abbott-style conservatism and Tea Party ideology do not map perfectly, nevertheless it is true to say that they are both examples of conservative populism that take pride in dismissing scientific opinion as “elitist”. Such movements pander to and encourage the ignorance of downwardly mobile members of socially dominant groups. It is the politics of resentment larded with the folklore of nostalgia. And the punters swallow it with relish. As a wise man once said, if something is unsustainable, eventually it will stop. Eventually, more and more adherents of the Tea Party and like groups will be forced to concede that their nostrums will solve nothing. But much damage will be done before enough of them come to their senses. Many people will become sadder but wiser during the epoch of right wing populism. In my opinion, the article contains errors of fact, and is biased and subjective. We are still waiting for your considered response. 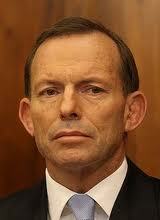 As an Australian it scares me that Abbott might become Prime Minister. He has yet to mouth anything more than platitudes and three word slogans in between running a vicious and nasty campaign because he didn’t get his way last time. Take a mild exception to your statement that Labor’s a bit short of stars. It has them but their lustre’s dimmed by a relentlessly negative press. Largely Murdoch owned & almost entirely Murdoch influenced, our mainstream media’s set its sights on this government. But the gist of your piece about Abbott is spot on. Possibly the only thing you missed is his bullying of those he can coupled with utter sycophancy to those he perceives as his superiors. Thanks for clarifying. Murdoch’s stranglehold on US media is slipping. Hope it goes south too. 🙂 To paraphrase The Dixie Chicks, I’m ashamed that Murdoch comes from Australia and now spreads his brand of unthinking dumbness around the world!